With just seven rooms, Anh Xuan is a small joint with a central location, at the post office roundabout. Rooms boast high ceilings, tile floor and the wall tiled halfway up, solid wood furniture, air-con, WiFi, fridge and flatscreen TV. It’s a local hotel and that means guests are allowed to smoke in the room. The room we saw had the strong smell of cigarette smoke from a recently checked out guest. 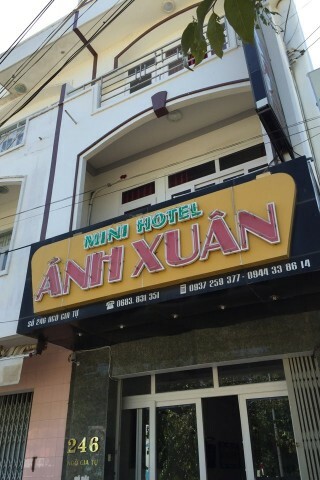 Anh Xuan is slightly cheaper than Phung Hung Mini Hotel, which is a few blocks away, on the other side of the roundabout and post office. If you don’t mind the wetroom bathroom and all the tile-work in the room, then Anh Xuan is perfectly fine for a night or two. Rooms are charmless but functional and there’s a delicious chicken rice shop just around the corner. Some English spoken.